Immigration law is complex, with so many different types of visas and immigration policies that allow people to enter the United States for work, travel, and education. From getting approved for a visa to earning citizenship officially, immigration is no simple, straightforward matter. Though the immigration process seems complex and difficult, it’s the best way to immigrate to the United States legally. Here’s what you need to know before beginning the process yourself. The first step in immigrating to the United States is applying for an immigrant visa. This petition – if granted – will allow you to visit or work in the United States. Most immigrants use the family- or employer-sponsored route to obtain a visa. Once in the United States, you can request a renewal of your visa, permanent resident status, or a Green Card, which grants full rights to live and work in the United States. At that point, you can study to qualify for citizenship if you choose. You’ll need to apply to the U.S. Citizenship and Immigration Services, or USCIS. After getting your petition approved, you’ll move on to the National Visa Center at the State Department. The requirements can be complex and confusing, so it’s important to hire a U.S. lawyer with experience and knowledge in immigration law if you want to get through the process efficiently and correctly. There are many types of visas available for immigrating to the United States. The two main categories are immigrant and nonimmigrant visas. Most nonimmigrant visas are those issued to tourists, but nonimmigrant visas can also be issued for education or work purposes. Family-sponsored immigration requires sponsorship of a family member in the United States. You must submit documentation of the relationship, and the USCIS must approve the petition. There are limits to immigration, and the U.S. State Department determines whether there’s an available immigration visa number. Employer-sponsored applications require similar documentation, and the employer must send a labor-certification request to the U.S. Department of Labor. This lottery allows 55,000 immigrant visas from “low-admission” countries, as determined by the INS, to immigrate to the United States. Applicants must have at least a high school education or its equivalent and 2 years of work experience in the last 5 years. The work must be in a field that requires 2 years of training. These visas allow engaged people to travel to the United States to marry a citizen. The Visa waiver program permits nonimmigrants from certain countries to enter the United States for up to 90 days. These permits are usually granted to conduct business. Tourist and business visitors can qualify for nonimmigrant visas to visit for pleasure or business. These visas are good for up to one year. Visas for education, known as F-1 visas, are available for qualified academic students who want to study at a high school, college, seminary, conservatory, or other institution in the United States. Students who want to attend a vocational school or nonacademic program must obtain an M visa. J visas cover exchange students, scholars, trainees and visiting professors. 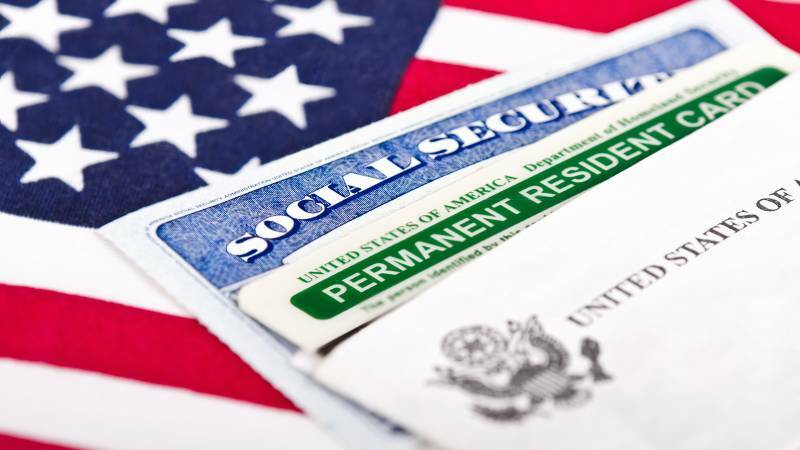 Nonimmigrant visas for temporary workers include specialty occupations employers find difficult to fill in the United States with qualified citizens. These include programmers and systems analysts. The visas are also granted when certain employers need temporary labor for harvesting crops, logging, or building in extreme environments. The costs of immigrating to the United States vary by country, visa type, and attorney fees. The fees can run thousands of dollars. Most lawyers charge from $5,000 to $7,500 to shepherd immigrants through the process from visa to Green Card, ABC News¹ reports. The application fees cost extra. If you want the helpful expertise of an immigration lawyer who can expedite and successfully navigate the process, you’ll also need to pay any legal fees. According to CostHelper², an immigration lawyer typically charges an hourly rate for his services of anywhere from $100 to $300 per hour. A lawyer can help you file your appplications and all appropriate paperwork – but this too will cost you, totalling anywhere from $2,000 to $12,000, CostHelper³ notes. In order to get a full understanding of the costs, make sure to ask your immigration lawyer what’s included, what will require extra fees, and what you can expect financially. If you have an approved immigrant petition, you can adjust your status by applying for permanent residence. If you haven’t received approval, you might be able to file for a Green Card and visa at the same time depending on your immigration category. Regardless, you should expect delays. The process could take a few months up to 10 years, VisaGuide.com⁴ reports. Immediate relatives usually get processed within a few months, with family preference applications taking from 1 to 10 years. The immigration process in the United States is complicated by changing laws, visa limits, and political opposition. However, the United States was built on immigration, and many residents have become citizens through this complex process. Before you begin the immigration process, make sure to do some research so you understand what you’ll need and what requirements are involved. You’ll also need a lawyer to guide you unless you have superior skill in wading through bureaucratic red tape. Immigration lawyers can simplify the process for you and your family members, and they can ensure you complete the process correctly and as quickly as possible. To determine if an immigration lawyer can help you, consider getting a free consultation from an attorney in your area before you decide. If you’re interested in hiring an immigration attorney, start a search today.